Virtual fitting room (VFR) is a technology that helps shoppers to try a variety of clothes in a virtual manner. The person needs to use his or her body virtually rather than physically, to select the color, size, style, fitting, and other parameters related to the purchase. In other words, VFR is an imitation of trying apparel similar to a video game version of a changing room. VFR-enabled shopping is available for physical stores and e-commerce websites and apps. VFR offers an incredible perspective of knowing the exclusive choices of each customer and presenting them with correct options based on their buying patterns and sizes. The global virtual fitting room market was valued at US$2,501.8 Mn in 2017. It is anticipated to expand at a CAGR of 22.7% during the forecast period. Physical store segment is expected to dominate the market throughout the forecast period. Growing implementation of virtual fitting room solutions in physical stores is the crucial factor which is boosting the growth of the virtual fitting room market globally. With current advancements in technology such as AR and VR, the expectation of end-users is increasing, in order to experience virtual surroundings in different applications. Retailers around the globe are implementing virtual fitting room solutions for different product categories such as apparel, jewelry & watches, eyewear, makeup etc. in order to broaden their customer base. The global virtual fitting room market is primarily driven by rising implementation of advanced solutions to offer better shopping experiences to customers. Furthermore, growing need to increase conversion rates and minimize returns and exchange rates is also anticipated to drive the growth of the virtual fitting room market around the globe. In the retail industry, specifically in online shopping, the return rate of apparel is very high. Most of the clothing ordered online is returned due to wrong fitting. Virtual fitting room is intended to be computationally effective, enhancing the manner of shopping online for new apparel. In addition, growing IT spending in the retail industry is also a major factor expected to create new opportunities for the virtual fitting room market. Increasing online shopping and growing usage of smartphones are the major factors which are likely to create new opportunities for the growth of the virtual fitting room market during the forecast period. This is primarily due to the rising trend of online shopping among consumers, specifically among the millennial. Furthermore, attractive offers and shortage of time are the other factors boosting online shopping across the world. The adoption rate of virtual fitting room solutions as well as VFR enabled mobile applications in developed regions such as Europe and North America is estimated to increase substantially in the next few years. North America accounts for the largest share (in terms of revenue), in the global virtual fitting room market. Major factors supporting this growth are the high penetration of advanced technologies as well as fairly high penetration of Internet-based services in the region. Online shopping in North America is the most preferred way of shopping because shoppers do not want to spend more time on selecting clothes from a retail store. However, physical store retailers are also implementing virtual fitting rooms to gain market traction in the region. Asia Pacific is anticipated to witness lucrative growth in the virtual fitting room market during the forecast period. Willingness to use digital retailing options in the future is highest in the Asia Pacific region. Therefore, rapid digitalization of retail industry in the region is contributing to the growth of the VFR market. 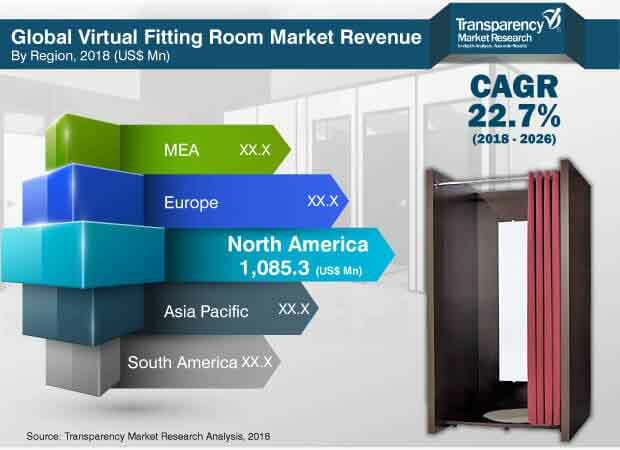 The global virtual fitting room market includes different players such as Zugara, Inc., Visualook, Virtusize AB, True Fit Corporation, Total Immersion, Sizebay, Secret Sauce Partners Inc., REACTIVE REALITY GMBH, Metail, Imaginate Technologies, Inc., Fitnect Interactive, Fitle, Fit Analytics, ELSE Corp srl, Dressformer, Coitor IT Tech, and 3D-A-PORTER LTD.
A quickly evolving competitive environment, seismic shift toward advanced shopping, and the continuously changing opinions of highly informed customers are leading to a new perception in the retail industry. Fashion retailers are adopting virtual fitting rooms to drastically enhance the online as well as in-store shopping experience and save shopping time of their customers. This report by Transparency Market Research provides insights to how the ecosystem has evolved over the forecast period spanning a term of ten years, viz. from 2016-2026. Right from providing analysis of changing capital investment patterns by retailers on integrating advanced technologies in their stores or implementing new features in their e-commerce websites and apps, the report ensures that a holistic approach for market analysis is adhered to, enabling stakeholders to make informed strategic decisions. The demand estimates of the virtual fitting room market have been broadly analyzed by segmenting it on the basis of end-users, which includes e-commerce and physical store. Physical store is further bifurcated into Apparel, jewelry & watches, eyewear, and others (shoes, cosmetics). Based on component, the market has been segmented into hardware, software, and services. Hardware segment is further categorized into prefabricated and customized. Of these, customized hardware segment has been further segregated into smart mirrors, screen/display, and others (sensors, etc.). Software segment is categorized into firmware/platform and mobile application. Services segment is categorized into consulting, integration, and maintenance. The above detailed analysis of market size estimates has been provided for the following geographic segments North America, Europe, Asia Pacific (APAC), Middle East & Africa (MEA), and South America. Across each of these regions, top-line market estimates for the U.S., Canada, U.K, Germany, France, China, India, Japan, GCC, South Africa, and Brazil has been included within the research scope. To further support market analysis and help build deep understanding of growth dynamics, the report provides the following analyses – impact of consumer behavior on virtual fitting rooms, analysis of different technologies supporting the growth of the virtual fitting room market, and trend analysis of the retail industry. Macro-economic factors analysis, Porter’s five Forces Analysis, technology roadmap, virtual fitting room value chain analysis, market attractiveness analysis, and competition matrix providing matrix of competitive positioning of key players as per select parameters are also analyzed in the report. The market sizing methodology adopted involved a multi-pronged approach, ultimately resulting in data being triangulated from all models/approaches. Primary focus has been on analyzing information as retrieved through the primary approach which required interaction with industry experts. These included professionals across companies involved at various stages of the ecosystem/supply chain. Data heads such as technology adoption and penetration trends,total number of fashion stores, capital expenditure trends, technology hurdles and outlookwere some of the key parameters modelled based on inputs received. These were simultaneously also verified against information collected through different secondary sources. Major sources include company annual reports, analyst briefings, technology white papers, industry magazines/publications, expert blogs, and paid secondary databases. Apart from data aggregated from these models, the process also involved analysis against available in- house repository and expert panel opinion. The analysis included in the report has been developed based on a study of key performance parameters of companies active across the ecosystem, with virtual fitting room solution providers making up the majority of the list. Some of the players/companies which were subsequently profiled and included in the final report draft include Zugara, Inc., Visualook, Virtusize AB, True Fit Corporation, Total Immersion, Sizebay, Secret Sauce Partners Inc., REACTIVE REALITY GMBH, Metail, Imaginate Technologies, Inc., Fitnect Interactive, Fitle, Fit Analytics, ELSE Corp srl, Dressformer, Coitor IT Tech, and 3D-A-PORTER LTD.